Since 1998, there has been an ongoing battle between Google on one side and SEOs eager for fast results – on the other. If we go back in history, we’ll find out that Google started from Backrub research project by Larry Page and Sergey Brin in 1996. Back in the day, search engines measured the relevance of search results by the number of times certain keywords appeared in the text. Page and Brin argued that in order to obtain results of higher quality, it would be better to rank pages based on the backlinks they receive from relevant high-authority pages. That’s how PageRank algorithm was born. Quality. That’s the main concept which has been determining Google’s direction ever since it has been founded and that’s the concept we always have to keep in mind when trying to understand reasons why Google is doing certain things. PageRank was the first algorithm used by Google, but now it’s just one among more than 200 factors Google takes into consideration when ranking pages striving to deliver most relevant results which will satisfy users’ needs. Modern-day Google does an exceptional job identifying what users are actually searching for, dealing with ambiguities, vague queries and peculiarities of natural language which machines find rather challenging to process. Let’s take a look at two queries which use similar words, but ask for different information and see how Google can handle those. The first one will be “Who was with Jennifer Aniston in Friends” which aims to find out the cast for the famous TV show. The task for Google here will be to identify “Friends” as TV series, and not one’s life buddies. Let’s see what the result is. Nice! Exactly what we asked for. If you think about it, it’s pretty logical as Jennifer Aniston’s name appears really often in association with the TV-show. Let’s run another search. 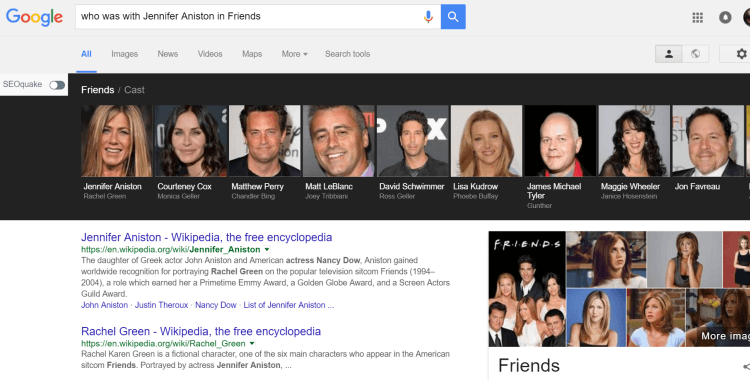 This time, let’s ask Google “Who are Jennifer Aniston’s friends”. Take a look at the no. 1 result. That’s amazing how Google noticed a subtle difference in the queries and delivered 100% relevant results. That’s the difference that only a human can spot, correct? Well, not exactly. Since 2015 Google has been massively using RankBrain, a machine learning AI system, which contributes to providing high-quality search results. What makes RankBrain different from other algorithms used by Google? The key phrase here is a “machine learning system”. Before RankBrain, Google engineers had to put a lot of data manually building intricate relationships between terms, phrases, and concepts so that the algorithm can “understand” subtle differences and provide relevant results. Now, they feed a lot of data to RankBrain which learns the provided information and tries to predict new queries which this information might satisfy. The original problem which RankBrain is called to resolve is that Google receives more than 3.5 billion searches a day and 15% of those searches have never been seen by the search engine before which creates certain difficulties in terms of how to handle those queries and which results to provide. And that is where RankBrain comes into play trying to make its best guess in order to refine search results which appear for the first time. Google confirmed that they were using RankBrain algorithm in October, 2015 and in March of the following year Google confirmed that RankBrain was the third most important ranking signal preceded by links and content. This means that Google trusts RankBrain a lot and its role will certainly grow even more in future. In May 2016, Google’s CEO Sundar Pichai revealed that 20% of searches on the Android mobile app came from voice which means that queries become much more complex for search engines to handle as they have to deal with natural language. The number of voice search queries grow at humongous speeds doubling over the past year, it doubled in 2014 as well. This means that Google will adapt to these changes and RankBrain will play a major role in dealing with natural-language queries. Based on what we already know about RankBrain, how can we make our content more lovable for the new algorithm? 1) Sound natural. Natural language processing and dealing with “difficult” queries is what RankBrain was built for. Hence, it’s pretty logical to assume that RankBrain will reward content written in the language optimized for humans, not the machines. The bottom line is that it’s probably better not to focus on RankBrain at all, but pay more attention to your audience instead, trying to satisfy their needs by delivering premium content which will be actionable and easy to process. 2) Make sure your posts are deep and meaningful. Make it super easy for your audience and algorithms to understand what problem your content is dealing with and how you can help to find the solution. It’s better to create long-form content as it will help Google better identify the topic and the purpose of your piece of content as it uses something called co-occurrence. Since RankBrain is built to deal with queries which have never been seen before, it depends highly on co-occurrence in order to deliver best results. Didit’s Steve Baldwin explains that co-occurrence is “the existence of words and phrases in query results not in the query executed by the user, but in related queries logged by the algorithm and mapped via word vectors”. 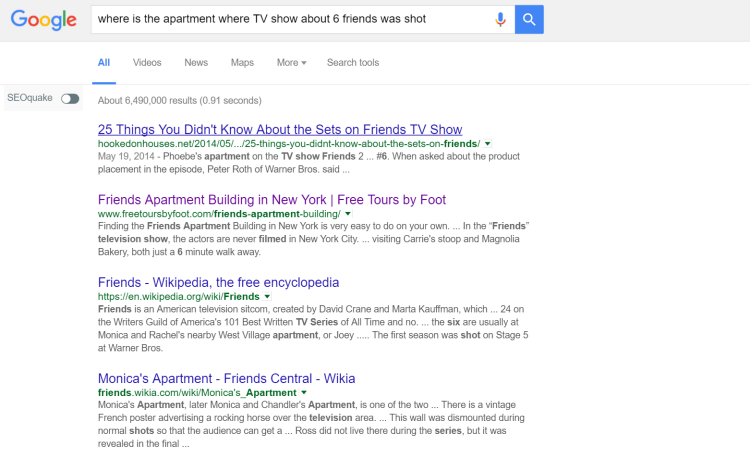 This makes it possible for RankBrain to return meaningful results for such obscure queries as “where is the apartment where TV show about 6 friends was shot”. At first, the algorithm has to guess that the “TV show about 6 friends” is Friends and then it has to look for the actual building. As we can see, it’s not a problem for the search engine which is incredible. Long-form content allows us to use different synonyms as well as related terms and concepts naturally which increases your chances of being recognized by Google in the queries which are related to your topic, but not necessarily use the same words you did in your posts. Make sure you use a lot of different descriptors that fit naturally in your content and don’t make it look like keyword stuffing. 3) Include mentions of case studies, research and high-authority sources. Including data from case studies or white papers, for example, will add value to your content and help Google to decide if your content is relevant for search results based on user intent. When creating content, make sure that you show that you’ve done significant research, included relevant data to support your ideas and mentioned several high-authority sources to gain credibility. 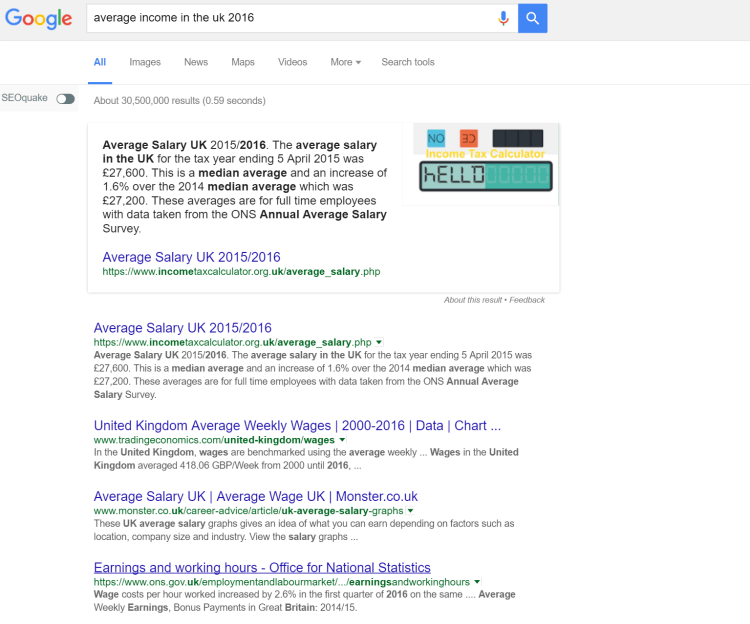 If you ask Google about “average income in the uk 2016”, you’ll get quite a few results which include official reports and statistics related to salaries in the UK and not just people complaining about low salaries or difficulties they experience at the workplace. Relevant content you can trust is a great signal for Google that you deserve higher rankings. “I can tell you what they are. It is content. And it’s links pointing to your site”. Everything is really interconnected in the way Google performs its searches. Optimizing for one ranking factor, you’ll inevitably hit the other ones. Discussing RankBrain optimization we were talking mostly about how to tweak our content which is a linking factor by itself. In 2016, links pointing to your site are still playing a major role for your positions. Should you go ahead and buy 2000 links from a shady link farm? Don’t even think about it! It’s all about quality, remember? If you do that, you’ll be hit by a penalty in no time and it’s hard to recover, really hard. That’s why it is much better to focus on what? Right! Content, again! Creating awesome content is not enough. To earn links and traffic to your blog, you have to promote it a lot. You can try Brian Dean’s good old Skyscraper technique for creating and promoting your content, it still works! Why? Because it’s focused on quality which Google loves! With RankBrain, we’re entering the era of SEO which relies on providing quality rather than black-hat techniques aiming to game the system. The advice for bloggers, marketers and everyone who wants to rank higher would be to become better every day and you’ll be rewarded. Let me know your thoughts on RankBrain. What are you doing to create and provide better quality content RankBrain will love? Leave me a comment below. It’s great to be introduced to you through Fabrizio’s site! What Googleis doing with RankBrain is both brilliant and extremely helpful. It’s more and more refreshing to find what I’m actually looking for instead of having to sift through titles, meta tags (obviously in the title/link on the search) and then clicking through only to discover it was a bait or waste of time. I think this is only going to improve over the coming months and years. As a content producer, this also makes my life a lot easier and one less thing to worry about as long as I keep I keep my focus, I’m very clear, and create content that truly provides value and helps someone. As I always say, create content for one person who has one problem / need/ want / desire and fulfill it. Have a great week Fabrizio! Thanks for stopping by, glad you enjoyed the post. I completely agree, we as content creators will be able to make our content more specific to individual needs and problems. You hit the nail on the head there Don. I’ve never heard of RankBrain before. This was a nice introduction of what it is and how it ranks our content. I’ve notice lately that whenever I do a specific search, Google has been right on target as of lately compared to years past. Thanks for the share! Have a great week!